The layman might assume on one viewing that the mantelpiece that is Trollope is shallow and unsophisticated, and one or two of those words might well be true. But an intellectual, (if I could get one to read it), would have a completely different opinion. The research that Ronnie Leek put into this piece took a full afternoon in a library! His eyes propped open with matchsticks as he slaved making notes, a librarian peeped over his shoulder and, catching a glimpse of what he was writing said, “yer gonna ‘Ave t’ go love I need to lock up and I’ve had a shank in a slow cooker for most of the day. What Ronnie offers to us in one hour of entertainment is a cornucopia of little known facts about many of the worlds most famous historical figures. Who would have thought that HG Wells was inspired to write his novel The Time Machine by a man who travelled back in time in the time machine that he was yet to write about? That Dorothy Wordsworth held secret, saucy desires for Thomas De Quincy and thst Sid Vicious and Julius Caesar loved each other. Meet the actors who will play in our first production, ‘Trollope’. graduating from @ItaliaContiAct last July, Simon was a member of the MAPRep company at @53two, starring in the premiere of “Stay Happy, Keep Smiling” by @WAPtheatre as well as “Eight” by Ella Hickson and MAPRep’s adaptation of Dickens’ “A Christmas Carol”. He’s super excited to be putting his comedy skills to good use in #Trollope as Percy Trollope. Ali Kahn is a comedy actress specialising in improvisation.Performing ‘The Chair’ at the Greater Manchester Fringe Festival in 2017 which was a self penned one woman piece where Ali played 3 characters.She hosts a regular comedy night at Nexus Art Cafe called ‘Addictive Comedy’: Manchester’s only alcohol free comedy event. Her screen credits include Coronation Street and Emmerdale. Ali has hosted and is the current champion of the ‘Lip Sync Battle’ appearing at both The Comedy Store and The Frog and Bucket.Alongside performing Ali runs her own company Big Comedy Shop that specialises using comedy with young people.Ali is currently working on a number of short comedy films that will be completed later in 2018.Ali’s comedy creations can be found on her Facebook page and You Tube channel ‘Alikahn comedy’. Jennifer was nominated for best actor at the 2017 Greater Manchester Fringe. 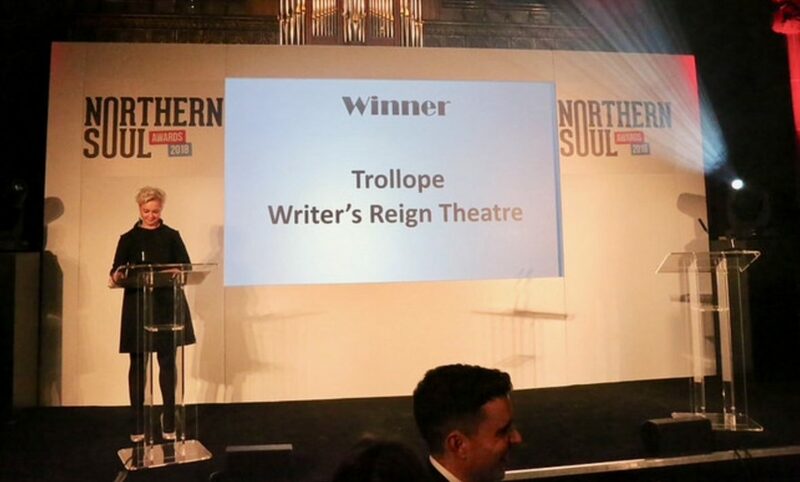 Star and writer of the Funny Women 2017 Best Show Award nominated Strife In A Northern Town, her screen credits include Coronation Street and forthcoming feature film Mrs Lowry & Son.